Lucretia Ann Keys, 80, Nevada, Mo., passed away on Thursday, April 4, 2019, at Medicalodges in Nevada. Lucretia was born Oct. 20, 1938, in Nevada, to Sidney Irwin and Mary Elizabeth (Horning) Riley. She was married to Paul Keys and together they had three children. Lucretia was baptized at Pine Street Baptist Church. She worked at Mattingly’s in Nevada for 29 years, and also worked for a time at Thriftway’s, and Nevada News. Lucretia enjoyed taking pictures, crocheting, reading, and was a member of Tri-County Wood Carvers. Survivors include three children, David Allen Keys, Gardner, Kan., Deborah Ann Keys Allen (Tom Johnson), Moundville, and Paul Elvin Keys, III (Vicki), Nevada; grandchildren, James Ragan, Michael Keys, David Keys Speagle, Kiara Reis, Donald Keys Speagle, Dustin Keys, and Victoria Forester; great-grandchildren, Nicholas Ragan, Katelyn Coll, Mackenzie Ragan, Samantha Ragan, Landon Ragan, Alexis Ragan, Samuel Findley, Kylie Findley, Natalie Reis, Julie Reis, Reese Keys, Hadley Keys, Tripp Forester, and Wren Forester; twin sister, Patricia Simpson, Nevada; nephew, Carl Simpson Jr.; and two nieces, Karen McCurley and Julie Simpson. 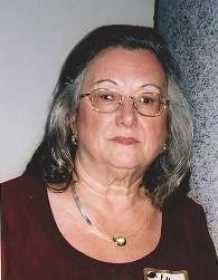 She was preceded in death by her parents; one grandson, Donald Ragan; and her companion, Virgil Belcher in 2006. Funeral services will be held at 1 p.m., Monday, April 8, at Ferry Funeral Home in Nevada with Pastor Sam Jones. Interment will follow in Moore Cemetery. The family will receive friends from 2 to 4 p.m., Sunday at the funeral home. Memorials are suggested to the family in care of Ferry Funeral Home in Nevada. View obituary and send condolences online at www.ferryfuneralhome.com.